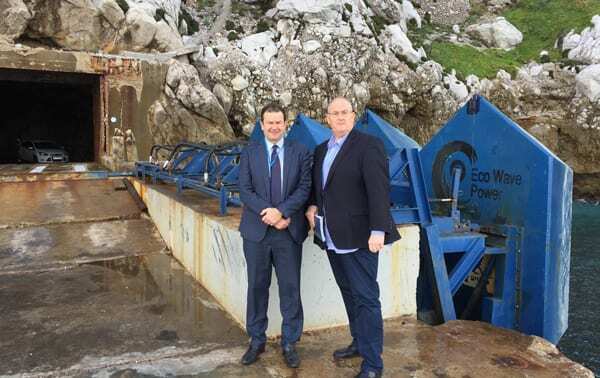 With NSW and Australian families facing record electricity bills, NSW State Labor MP Walt Secord visited the pilot site for an Israeli power company using ocean wave technology to create electricity in southern Europe. Mr Secord, who is Deputy Chair of the NSW Parliamentary Friends of Israel and Deputy leader of the Opposition in the NSW Parliament’s Legislative Council visited the Eco Wave Power (EWP) Ltd site in Gibraltar, the small British overseas territory in southern Europe near Spain. Tel Aviv-based EWP’s floaters move up and down with the movement of the waves, and create pressure which drives a hydro motor and a generator. It was launched in April 2016 and is situated on the east side of Gibraltar on a former World War II ammunition jetty. The project is operating through a 25-year power purchase agreement between Eco Wave Power, the Government of Gibraltar, and the Gibraltar Electricity Authority. The project is funded, in part, by the 2014-2020 European Regional Development Fund. The technology also provides smart automation system that controls the power station’s storm-protection mechanism and the stable transmission of clean electricity to the grid. Once fully constructed, the proponents hope that it can provide up to 15 per cent of Gibraltar’s electricity needs for its 30,000 inhabitants. Walt Secord was taken to the site by Gibraltar Electricity Authority Chief Executive Officer, Mr Michael Caetano in early January 2018. Mr Secord said wave technology has been suggested for many years, but it is difficult to find suitable conditions for the devices. However, CSIRO experts say that the southern coastline of Australia has the potential for wave technology due to the strong Southern Ocean winds which generate consistently large waves which travel northwards to Australia’s southern coastline. The large consistent swell provides ideal conditions for wave energy production. “The Israeli Gibraltar pilot was very thought-provoking,” Mr Secord said. “The concept is very simple. It harnesses wave energy and turns it into electricity. In NSW, we must look at all options to ensure that families in NSW can have access to affordable electricity – especially in the area of renewable energy like solar, wind and wave technology.